NEW YORK CITY, October 13, 2016 – The charming historic town of Conservatória, in the state of Rio de Janeiro, will host the inaugural GFNY Brasil. Conservatória, known for its stunning nature with rolling green hills, waterfalls and rainforest-covered mountains, is located in a picturesque region two hours north of Rio de Janeiro that was the heart of Brazil’s coffee industry in the mid-1800s. Brazil is a particularly special nation for GFNY. On May 15, 2016, over 700 Brazilians tackled the Campagnolo GFNY Championship in NYC. For the second year, Brazil was the second-largest contingent at the NYC race after the host nation, USA. Two distance options will challenge riders, a 160km / 100-mile competitive long course and a 72km / 45-mile medium non-competitive route for riders who want to experience GFNY but are not able to tackle the 160km long course. A former coffee plantation will host the pre-race expo and post-race festivities. The grand estate is located in a beautiful setting in the countryside, with green pastures bordered by stretches of lush Atlantic rain forest. 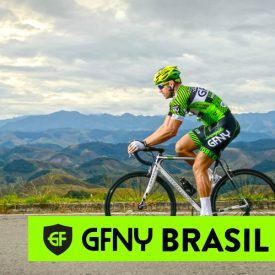 G FNY is the global cycling marathon series with events held in NYC, Brasil, Italy, Mexico City, Indonesia, Cozumel-Mexico, Argentina, Colombia, Uruguay, Germany and at Mont Ventoux-France. The 7th annual Campagnolo GFNY World Championship New York will be held on May 21, 2017. The race features the world’s most international peloton with riders from over 90 countries. Athletes take on a challenging 100-mile route from NYC to Bear Mountain to Fort Lee to compete against each other, the clock and themselves in a personal endurance challenge. At all GFNY events, riders have the chance to qualify for the elite racer corral at the GFNY Championship in NYC by placing in the top 10% (20% at regional championships) of their age group. The official GFNY website is: gfny.com.